Not so much fly-on-the-wall as cat-on-the-sill, this is the warm-hearted tale of a small kitten rescued from the slums of New Delhi who finds herself in a beautiful sanctuary with sweeping views of the snow-capped Himalayas. In her exotic new home, the Dalai Lama's cat encounters Hollywood stars, Buddhist masters, Ivy-league professors, famous philanthropists, and a host of other people who come visiting His Holiness. Each encounter offers a fresh insight into finding happiness and meaning in the midst of a life of busyness and challenge. 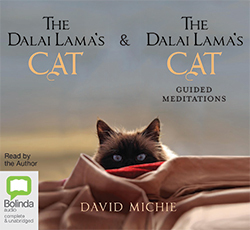 Drawing us into her world with her adorable but all-too-flawed personality, the Dalai Lama's cat discovers how instead of trying to change the world, changing the way we experience the world is the key to true contentment. This audiobook also contains six delightful tracks taking you through guided stretches and sits, including: How to sit when you meditate Standing roll down and breath counting Paw raise and purring Threading the needle and body awareness Cat pose and visualisation technique Shoulder bridge and analytical meditation Paw stretch, tranquillity and affirmations.